Solid State Drives or SSDs are pretty common these days. SSDs are fast and quite reliable as well. Most of the mid to high-end PCs these days use SSDs rather than the traditional HDDs for storage. If you recently bought a new PC but not sure if it has Solid State Drive, you can easily check if your PC has SSD without opening the manual or disassembling your computer. 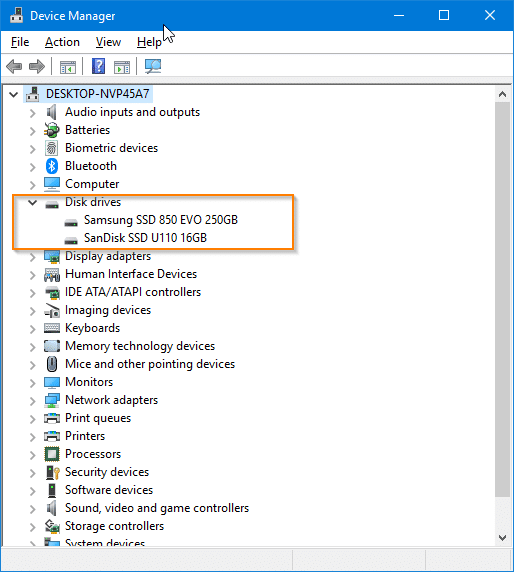 Following are the four easy ways to know if your Windows 10 computer has SSD. In addition to these methods, there are dozens of the third-party utilities out there like CPU-Z and Speccy to determine the type of storage being used on your computer. These third-party utilities can also provide you advanced information about your computer that you might not be able to find otherwise. Step 1: Open the Task Manager either by using Ctrl + Shift + Esc keys, or right-clicking on the taskbar and then clicking Task Manager option. Check out our 11 ways out open the Task Manager in Windows 10 guide to know more ways. Step 2: Switch to the full mode if it opens in small view. Step 3: Under the Performance tab, click on the disk on the left side to know the actual name of the drive on the right side. The name usually indicates the type of the drive (SSD or HDD). If your PC has more than one internal drive, you will have to click on all of them (on the left-side) one after another to know their properties. As you can see in the picture below, my PC has two drives, and both of them are SSDs. The tab also displays the manufacturer’s name and model number of the SSD as well. Step 1: Right-click on the Start button on the taskbar and then click Disk Management option to open its window. 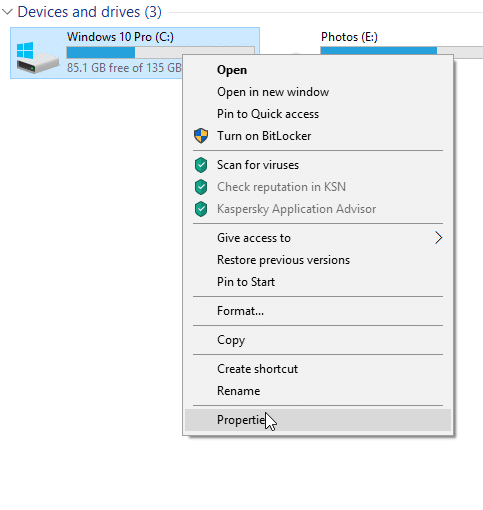 Step 2: On the left side (as shown in the picture below) of the window, you can see all internal and external drives currently connected to your PC. To know if a drive is HDD or SSD, right-click on it and then click Properties. 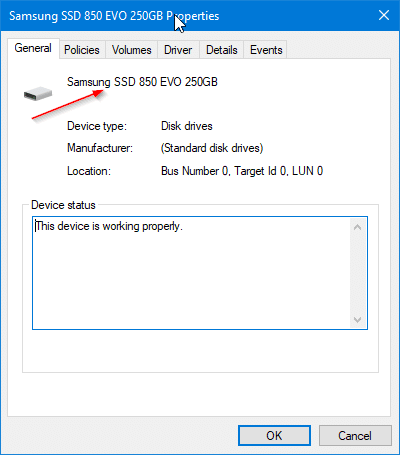 Step 3: The General tab displays the actual name of the drive which usually indicates what kind of drive (SSD or HDD) it is. Step 1: Open the File Explorer and navigate to This PC. 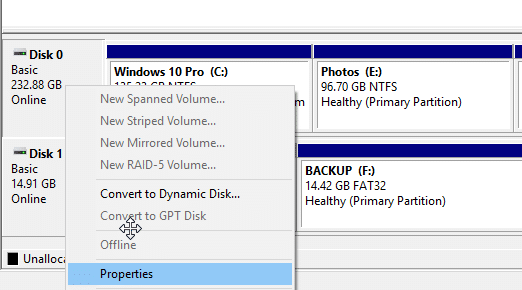 Step 2: Right-click on a partition drive and then click Properties to open its properties dialog. 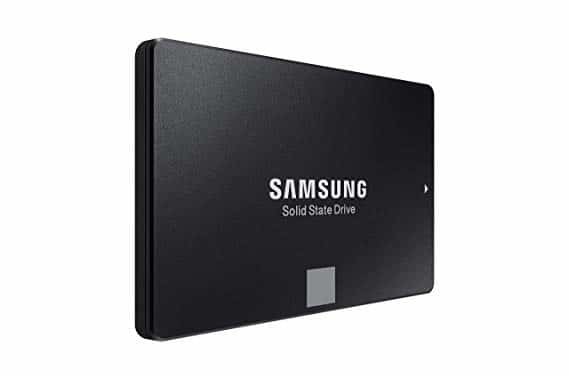 Note that if you have more than one physical drive, you need to make sure that you are right-clicking on a drive that belongs to the physical drive that you want to know whether it’s SSD or HDD. Step 3: Under the Hardware tab, you can see if your PC has SSD or HDD. If your PC has more than one drive, the Hardware tab lists all drives and highlights only the physical drive where your currently selected partition drive is located. Step 1: Open the Device Manager by right-clicking on the Start button on the taskbar and then clicking on the Device Manager option. 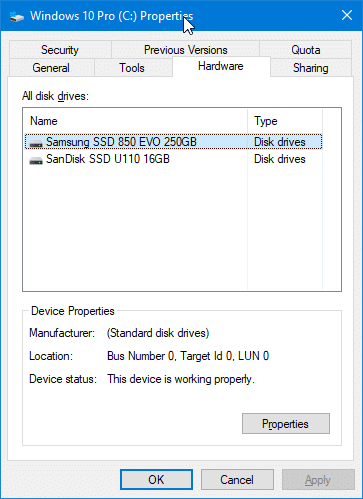 Step 2: In the Device Manager window, expand Disk drives tree to see the name of the drive which also includes the type of the drive (SSD or HDD). 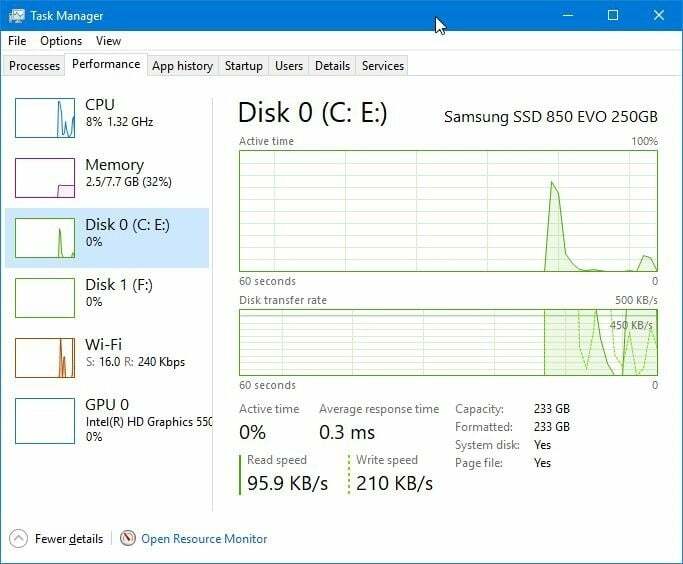 Our 11 free tools to tweak and optimize SSD performance in Windows 10 guide might also interest you. i am trying to just get into word so I can type a letter. can you help me?